Ca. nov. 2011 I also wrote: This Sunup dynamo may be similar in principle to the Lightspin. If you make the dynamo go round without load it will simply keep spinning freely for a while. There's another dynamo that keeps going round for a while without a load, the Go go shine dynamo (they say on that page the wires aren't wound around steel but plastic (and what's the efficiency?)). More on Sunup eco's DS generator: This was supposed to be available in November 2010 under the Dosun name, but it was delayed. Sunup want to make sure in particular that the voltage overprotection is correctly working, as the dynamo is not of the same design as other dynamos and dynamo hubs (it's a 3 phase generator whereas standard dynamo designs are claw-pole generators which are current-limited to about 0.50 A (well, at least with a true resistive load)). From their documentation the weight of this generator is ca. 650 g - 720 g (not sure which was the earlier version) and in the Sunup pictures it is shown in various colours. Sunup eco, from what I heard could be putting more effort into marketing these generators themselves. Interestingly, the Sunup version shown there has a rear lamp in the dynamo... (the text says the Dosun version is the one with the lamp, but the picture shows 'Dosun' on the one without a lamp). On this point I would like to say: I have seen someone ride a bike with Reelight type lighting, mounted at axle height, and this was very bad for visibility, as you're not looking that low which means automatically less attention goes there (unless it's insanely bright, to give an example), so I'm not keen on rear lamps that are mounted very low. Also, a rear lamp at axle height on the left hand side of the bicycle is not very visible from the right hand side, which is not often a problem, at least in countries where you ride on the right hand side of the road, but it can be a possible problem such as in the case when a car comes from your right (on an intersection), in which case the driver won't see much of that rear lamp. Mass: 665 g, 769 g with all mounting hardware. At first the idea was to just give a general impression and not a proper critical review, but Sunup was ok with a proper review even though it was still considered a pre-production model. This also meant I could discuss any flaws, should I find them. The idea was also that if I did find any, they intended to work on fixing them. During my review the generator was already considered stable, and any ideas/suggestions/problems I found may be implemented/fixed in a next generation of the generator. It seems to work for hubs with shell diameter outside the flange of up to ca. 34 mm. Alternatively, it could be fitted if the distance from the hub shell where it is wider than 34 mm is more than 26 mm away from the axle end (I mean the start of where the threaded axle comes out). 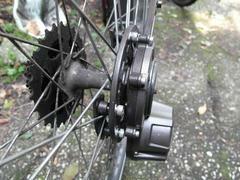 Mounting on a front hub (normal or dynamo hub) doesn't work on all the ones I tried as you you need at least ca. 26 mm from the hub/flange to the axle. It's not what the generator was designed for of course! (But I was curious). 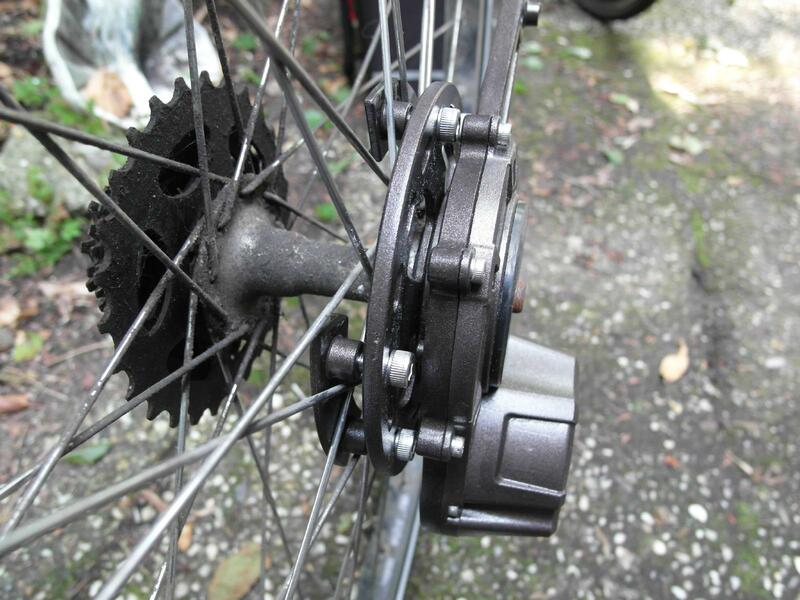 Mounting on a rear wheel with drum or roller brakes doesn't work. 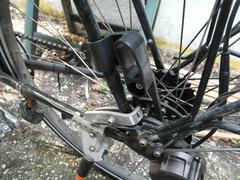 Mounting on a rear wheel for brakes disc with 6 bolts (IS) doesn't work (needs more than 26 mm to the threaded axle). 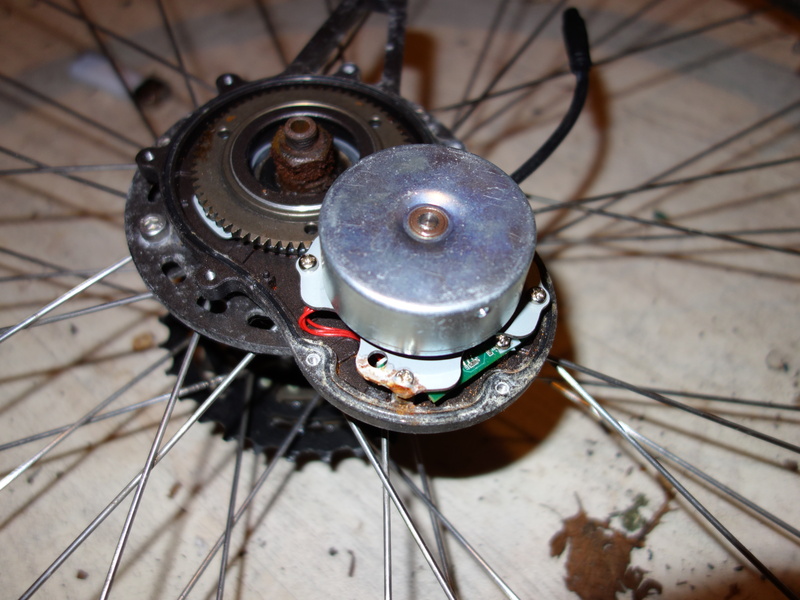 I was told the people from Sunup have considered making the generator work on disc brake rear hubs (in a different way than what I suggested below), but that they couldn't do this at the moment (without a huge effort into redesign I presume). Nevertheless, I suggested making the diameter of the dynamo's drive wheel slightly larger so it could fit over centre lock and IS 6 bolt brake disc hubs, using switchable inserts to mount the dynamo to that brake disc mount. This could even eliminate the need to mount it on the spokes, at least when fixing using the brake disc mount. Another option is to let the generator get driven by an IS 6 bolt hub with an insert around it but in between spokes and brake disc. 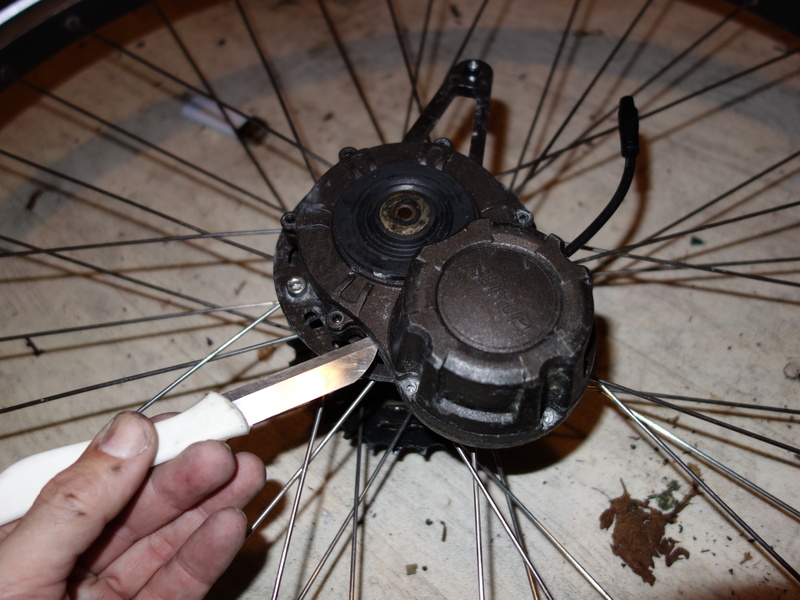 The generator should fit between the brake disc blade and the spokes, at least in the hubs I've seen. I mounted it on an old rear wheel for derailleur, and turned it by hand, and the wheel with dynamo kept going for about 7 seconds with just a very slow push. 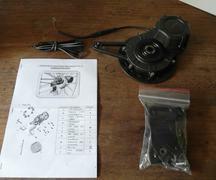 For installation you use 3 or 4 aluminium plates which keep the generator securely fixed to the rear wheel. For 36 spoke wheels (18 spokes per side) you can use 3 mounting plates while keeping symmetry. I.e. the next plate will be mounted on the end of the next 6 spokes which are 120° further. 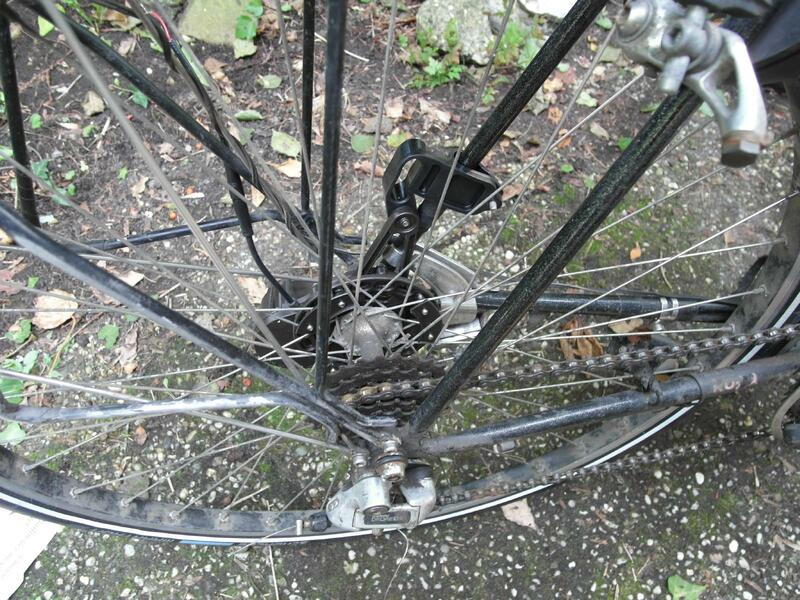 For 32 spoke wheels you will need to use 4 plates and mount the next plate at the end of the next 4 spokes. 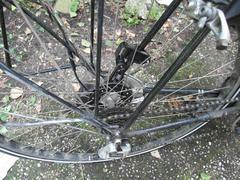 For 28 spoke wheels (14 spokes per side, which is of course not divisible by 3 or 4) you could use 2 mounting plates I suppose but the generator may get to sit not equidistant from the hub at all positions. So using 3 or 4 and just mounting them as best you can near to 90° or 120° from the previous plate is probably better. I don't notice the dynamo in use at all, which is how it should be (what a relief after years of annoyance by vibrations in the handlebar from dynamo hubs). Of course it can't slip like a sidewall dynamo, and I don't hear any noise either. This is actually a pretty cool dynamo. 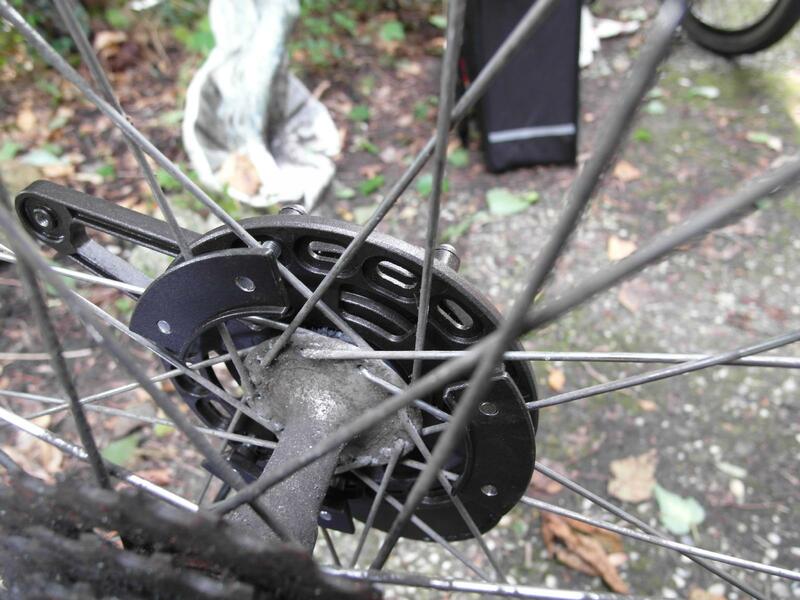 A version for use on brake disc hubs would be a fantastic alternative to a dynamo hub. What I did notice is that the hub doesn't give much power at low speed, this isn't bad most times except for people who have some very steep hills close by and regularly ride at about 7 km/h on uphill sections. I will check the exact speed at which light output is so low that the lamp switches to standlight. The output from the Sunup is actually DC. This is also why running an Edelux only works in one of the 2 possible wiring options (it's not due to a short-circuit as there is no electrical connection between the bike's frame and the generator; note that the Edelux has an earth connection...). The Philips SLD works whichever way you wire it up. Running the dynamo without load the multimeter shows 14V at relatively low speeds, so I will check and ask about the voltage limiter etc. 2011-11-11: I've done power output measurements with 1,2 and 3 XM-L LEDs in series. Measuring resistor = 0.05 Ohm. Light starts at about 4 km/h, below that almost nothing. Light starts at about 5 km/h, below that almost nothing. Light starts at about 15 km/h, below that almost nothing. On 22 Dec. I finally did the comparison test to show the difference in generated light at different speeds with both the Sunup and a regular dynamo hub. I made a mp4 movie of it but perhaps I will make a new one to better show the differences. 5 km/h: in both cases very little light. 7 km/h: with the Sunup DS still very little light, with the PD-8 a reasonable amount of light. 8-20 km/h: With the Sunup DS a bit less light than with the PD-8. Somewhere in the region of 20-25 km/h (I haven't determined it yet more precisely) the SLD powered from the Sunup DS gives about as much light as the SLD powered by the PD-8. The comparison test confirms the impression I had, which is that the main disadvantage of the Sunup DS is the low power output at low speed. If you ride a lot of hilly sections where you don't get above ca. 10 km/h a dynamo hub would be better. If you ride relatively fast (20 km/h and more) then this is about as good as a dynamo hub, at least to power a standard StVZO compliant headlamp. Not much power at low speed (say 7 km/h). 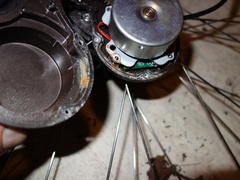 Only fits cassette rear hubs for rim brakes. 17-8-2013: I made a USB output for the DS1 which gave very good results. I used a 7805 linear regulator to get to 5V, then used resistors to indicate 2V on the D+ and D- data lines to indicate 0.5A charging capability, and this way I could charge my Galaxy Y phone by 17% in a 25 minute ride. This is better than the Luxos U which does about 14%-15% with a full buffer battery. 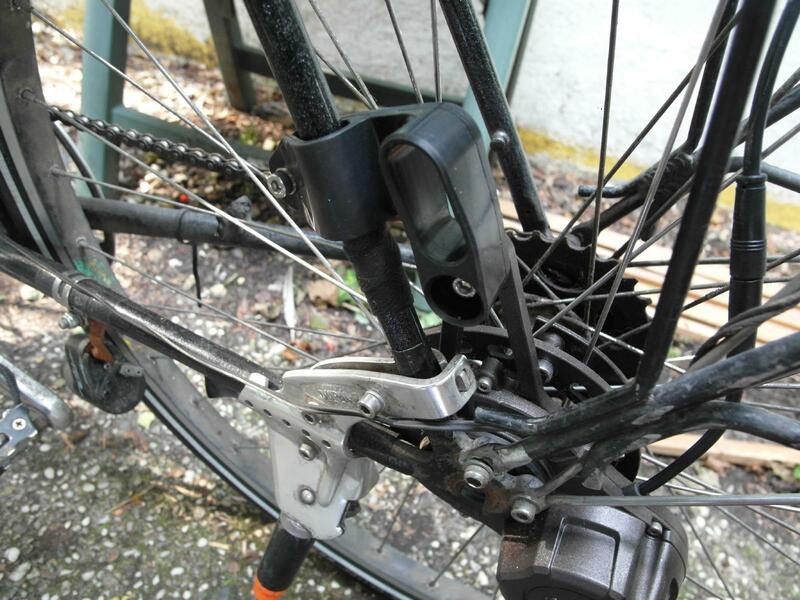 19-8-2013: After a few rides, with this USB output, I noticed a scraping sound, strangely only when riding with power off, and only on bad roads (vibrations, at each bump I heard this sound). I thought perhaps the magnets touched the coil but it turned out that the sound came from a bearing. I opened it up and there was a little bit of corrosion inside, but the real problem was that the bearing of the middle cog was running dry. I lubricated it and put some grease on the gears as well, which made it run noticeably nicer, so perhaps after 2 years of use, people should disassemble the Sunup and check for such issues, or is the Sunup supposed to last without ever disassembling? I asked the manufacturer about this but haven't got an answer, yet. I suppose the moisture could have entered the top, and I would think that a weak point is the rubber at the top where the power cable leaves the housing, this should be at the bottom for this reason of it being an extra opening. In any event, any water goes to the lowest point and there it has rusted the metal. When reassembling I put some threadlock on the miniature inner hex bolts as stainless steel in aluminium gives a strong reaction from the aluminium (galvanic corrosion). Aluminium corrodes into white powder, which I already saw on the bolts. I removed the powder from the bolts but not from the threads in the aluminium. In other stuff on the bike, such as pedals, this has usually resulted in bolts getting stuck so hard that I needed to destroy the bolts (or heat up the aluminium quite a lot) to get them out. That would not be nice on the Sunup particularly as the 3 bolts around the dynamo part would be hard to get out and to find replacements bolts... So using some Loctite or similar is a good idea. 2012-1-30: Power output has doubled in the new version which provides a huge amount of power at high speed. The old version provides (or better: can provide) a lot of power above 30 km/h, the new one reaches a little over 3W at 15 km/h and more than 8W at 25 km/h. Efficiency is yet to be determined. Ditto for power loss at higher speeds, can it be used efficiently? (the original version produced 10W at 40 km/h, the new one should provide 20W at that speed, which is a huge amount, and not really needed. It was not distributed at the time of my review, but some shops sell them by now. The recommended retail price by Sunup is $120,- which is about €100,- including VAT for EU. 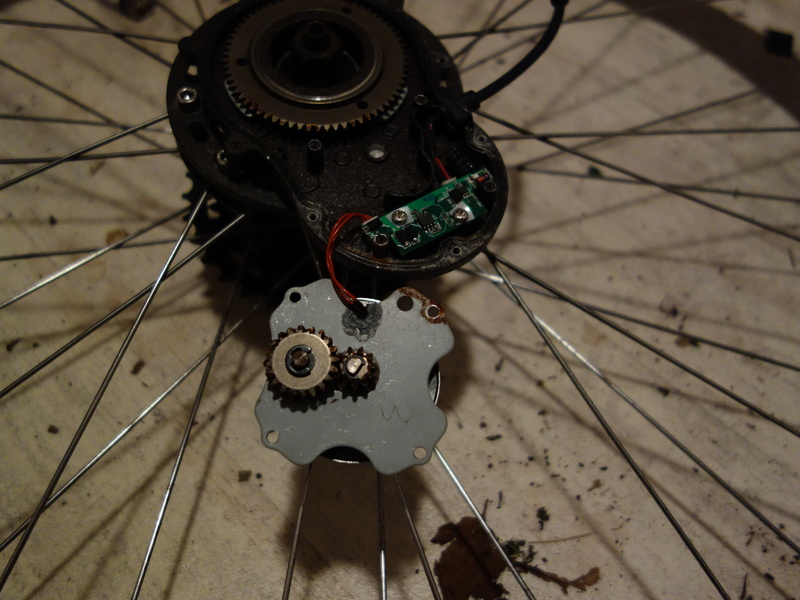 See Bicycle parts: Lighting.